The last death metal album that I reviewed from Kaotoxin Records was the quite excellent opus from Ad Patres. Well, now they have another monster on their hands, with The Fall of Omnius, from French band Nephren-ka. This release has more than patched up the space left by Darkall Slaves’ departure from the French label. Quite simply put; this is a damned monster. When I was a wee lad I was convinced that authors James Herbert and Frank Herbert were related. They must be, because surely two unrelated people couldn’t share a surname, right? Ah, the naivety of youth. Well, while the late, great former author was peddling a delightful line in horror, the latter had established himself with the wondrous Dune series of books. The series would spawn a flawed masterpiece from director David Lynch, and also inspires the writings of Nephren-ka. You might think, due to the band’s name, and song titles that they might be in the vein of death metal giants, Nile. There are some similarities, such as the conceptual nature of their albums, but Nile dealt with ancient Egypt, and aren’t really a shadow of their former selves. 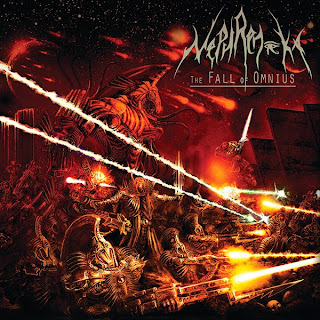 Nephren-ka, however, are fresh out of the blocks, also delivering a ferocious style of technical death metal, and The Fall of Omnius delivers on just about all fronts. Technical it may be, with intricate guitar and bass work laid over the monumental drumming, with Laurent roaring the vocals on top over everything, but there is far more going on here. The Fall of Omnius is a multi-textured death metal excursion, with a great many subtleties in the music, and the song structures. Due to this you will benefit greatly from repeated listens; it reveals more to the listener each time. The only area where I was disappointed with the album is the fade-out of the final tune, To the Golden Path. It’s an almost 8 minute death metal epic, but to fade it out just felt a little bit of an anti-climax. Mind you, the sand-ridden journey up until that point is quite simply majestic. The Fall of Omnius is technical, complex and brutal, but it is also incredibly accessible, even to the casual listener. Of course, the casual listener probably won’t get as much from it, as would someone that really soaks it in, but the hooks and great riffs are all here to enjoy. Kaotoxin are amassing quite an impressive roster, and I will be putting my money where my mouth is and buying myself a copy of this, even though I have the digital copy for review purposes. As far as worms turning go, the monster on Dune is turning just fine, thank you very much! The Fall of Omnius is released on September 3rd, by Kaotoxin Records, and can be ordered here.